Of the Banana Pancake Trail in Southeast Asia, this route is the most utilized one for Filipino travelers. Others do Ho Chi Minh City to Bangkok while some do the opposite. If you’re very eager to embark on your first backpacking trip in Indochina, this is the best itinerary to take as there are a lot of travelers doing it. Here’s a detailed Indochina itinerary and travel guide for Vietnam – Cambodia – Thailand tri-country trip. Enjoying a fine day in Ayutthaya from my Vietnam – Cambodia – Thailand backpacking last November 2016. NOTE: Don’t book a return flight to Ho Chi Minh City or Bangkok. It’s better to book a multi-city itinerary Manila – Ho Chi Minh City – Bangkok – Manila, or the other way around. This will save you a lot of travel time. DISCLAIMER: Some of the links in this post are affiliate links. If you think it will be more convenient for you to purchase these activities/passes for your Indochina itinerary, kindly book them below. The commission I’ll get for every successful booking comes at no extra cost to you. Filipinos can enter these countries visa-free just show your passport and clear your way out of the immigrations. There is nothing to pay on your arrival or on the borders when crossing one country to another. Vietnam and Cambodia provide stay for up to 21 days while Thailand offers 30 days if arriving via airport and 15 days via land borders. 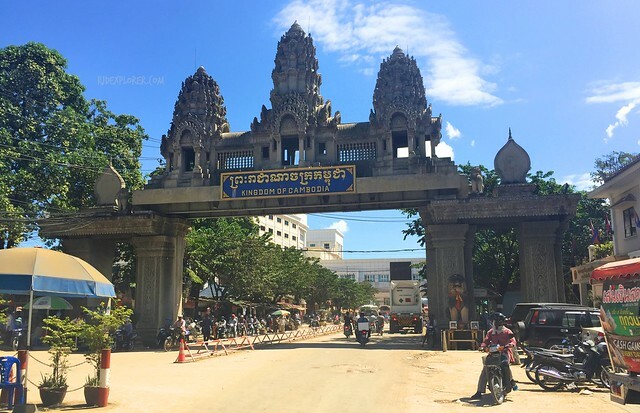 Cambodia – Thailand border on Poipet-Aranyaprathet checkpoint. Though you can visit these destinations whole year-round, the best months would be November to March for a cooler and drier season. But expect horde of tourists and higher accommodation rates. The other months imply a lower number of tourists and cheaper hotels but weather would still be fine with few afternoon rains. Take note that these countries have different currencies and the best way to hack your way out of this dilemma is to bring US dollar (USD) with you. It will be more convenient than having ATM withdrawals in each country. Vietnam is using Vietnamese Dong (VND), Cambodian Riel (KHR) for Cambodia, and Thai Baht (THB) for Thailand. After your arrival at Tan Son Nhat Int’l Airport, change few of your US dollar and make your way out of the terminal. Look for bus number 109 bound for Park 23/9, near Pham Ngu Lao where backpacker accommodations are located. If it’s too early for check-in, leave your baggage and start exploring Saigon attractions on foot. 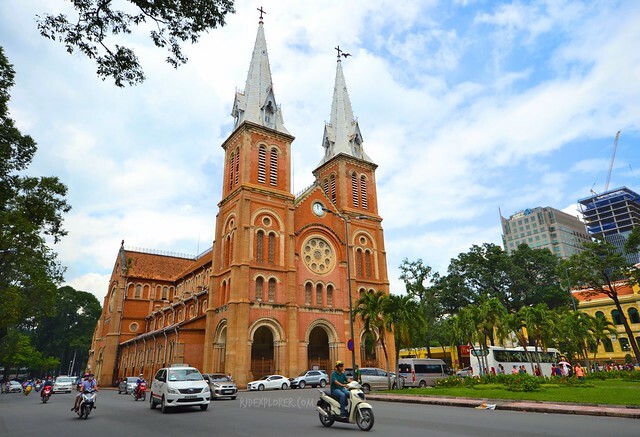 Start your walking trail from Benh Thanh Market, Independence Palace, War Remnants Museum, Saigon City Hall, Saigon Opera House, Notre Dame Cathedral, and Saigon Post Office. On one of your meals, don’t forget to try a legit bowl of pho. Street-vendors are everywhere and you could get a hefty bowl for as low as VND25,000. Cathedral Basilica of Our Lady of Immaculate Concepcion famous for Notre Dame Cathedral. 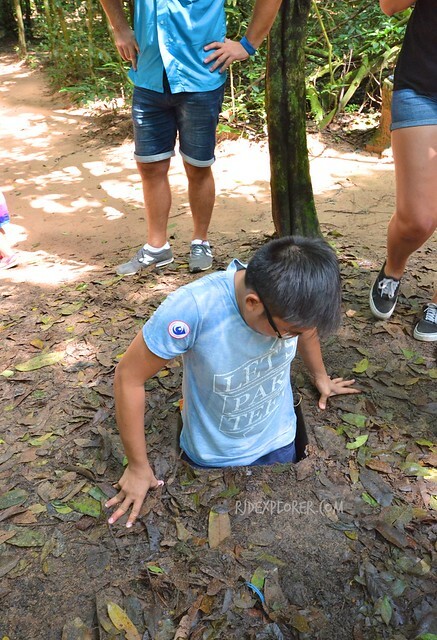 Cu Chi Tunnels is one of the remarkable sights in Ho Chi Minh City because of its role during the Vietnam War. To save some dongs, leave your hostel early and make your way to the station in Park 23/9. Look for bus number 13 bound for Cu Chi bus Station. From Cu Chi Bus Station, take bus 79 to the tunnels. Fares and entrance fee can be found on my detailed do-it-yourself Cu Chi Tunnel tour. If you have a lot of money to spare and looking for a hassle-free tour, book one from Klook. Accepting the challenge to go down the tunnels in this tiny hole. I didn’t try the Mekong Delta tour but you can fit this into your Indochina itinerary to discover how the river became a significant mean of transportation and trading in the past. Day tours are available from Saigon to the river and sometimes it will consume an entire day for the tour. If visiting the Mekong Delta is not within your interest, continue exploring Saigon on foot and discover other French colonial buildings and visit museums. My favorite Vietnamese Coffee with milk. 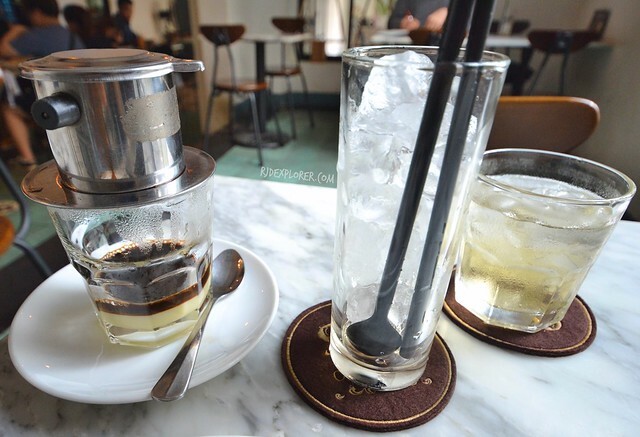 Before you end your visit in Saigon, find restaurants, cafe, or street stalls that offer Vietnamese coffee, they’re everywhere! You can have either black or with milk and coffee is served in a canister. If you ordered with milk, condensed milk will be poured into your cup. The coffee is a must-try when you’re in Vietnam. I suggest getting a morning bus from Ho Chi Minh City to Phnom Penh in Cambodia. Why? Because of immigration office hours. You don’t want to spend hours waiting for the border control to open so it’s still better to stay and get a decent sleep in your hostel in Ho Chi Minh City than having uncomfortable sleep in the bus. Border crossing Vietnam to Cambodia via Moc Bai-Bavet Border. Leave Saigon around 8 in the morning and make your way out of the immigration in few hours. Read the border crossing process between Vietnam and Cambodia for you not to get shocked when they ask for your passport. Arrive in the city around lunchtime perfect for an afternoon Phnom Penh tour. Start from the Independence Monument and walk your way to key sites like the Royal Palace, National Museum, Wat Ounalom, Central Market, and Wat Phnom. Book an afternoon departure to Siem Reap so you can still use the entire morning to visit the Tuol Sleng Genocide Museum and the Killing Fields. You can hire a tuk-tuk to go to these places but remember that it’s a bit expensive if you’re alone. I only had a visit to the genocide museum because it’s walkable from Mad Monkeys Hostel. 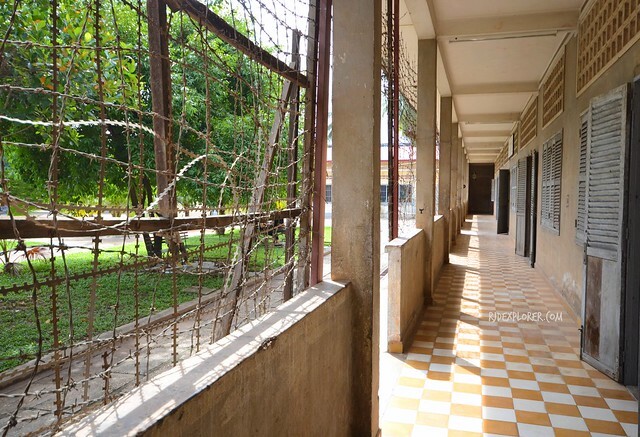 Hallways of one of the buildings at Tuol Sleng Genocide Museum. The afternoon bus leaving Phnom Penh will arrive in Siem Reap around 9 PM. Make your way to your accommodation and take a restful sleep in preparation for a tiring day at the Angkor Archaeological Park. Don’t forget to set your alarm clock for 4 AM wake up time. Go out and look for tuk-tuk drivers who provide tours at the Angkor complex. The locals already mastered detecting tourists looking for a tuk-tuk service, you won’t have a hard time finding one. There are two routes available, small and big circuit. Rates for the bigger circuit is obviously more expensive. I got a tuk-tuk for USD15 for the big circuit. The service will be from sunrise until sunset. Bayon Temple, one of the bigger temples at the Angkor Archaeological complex. Before going straight to the park, you need to get your Angkor pass. You can’t enter the heritage site if you won’t secure one. New rates are USD37 for one day, USD62 for three, and USD72 for a week pass. Go straight to the park and secure a spot inside the Angkor Wat for the much-awaited sunrise. Kick-off your temple hopping activity from here to all the temples in the park. In the evening, don’t miss the fun at Siem Reap’s Pub Street. The trip to Bangkok will consume one full day on this Indochina itinerary. Why didn’t I get a night bus to save a night from my hostel expenses and give way for another day of the tour? Similar to the Vietnam-Cambodia crossing, immigration hours in Poipet is 07:00-20:00. 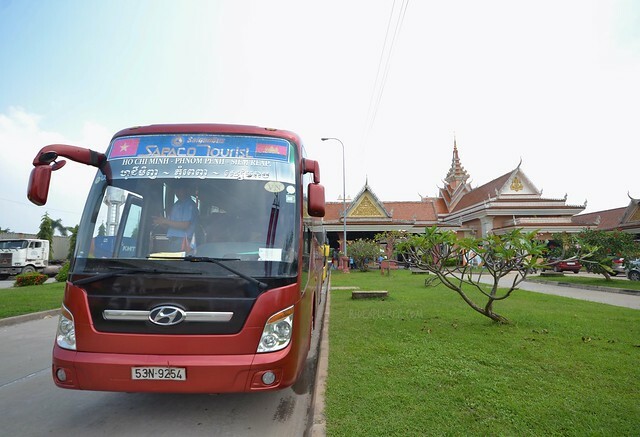 I read from a travel forum that night buses pick up passengers in Siem Reap around 8 in the evening but departure will commence only the following morning. 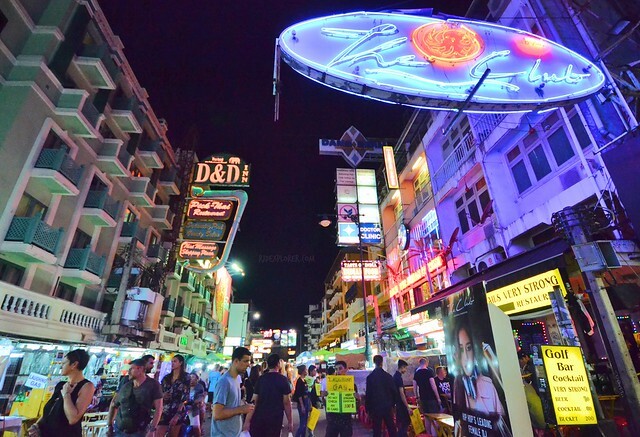 Arrive in Khao San Road around 8 PM and enjoy the parties and night scene if you still have energy left. Infamous Khao San Road in Bangkok. There’s nothing much to do in Bangkok and one of the best things to try is to have a day trip to Ayutthaya, the ancient capital of Thailand. Another park similar to Angkor Archaeological Complex but more on the Thai side. 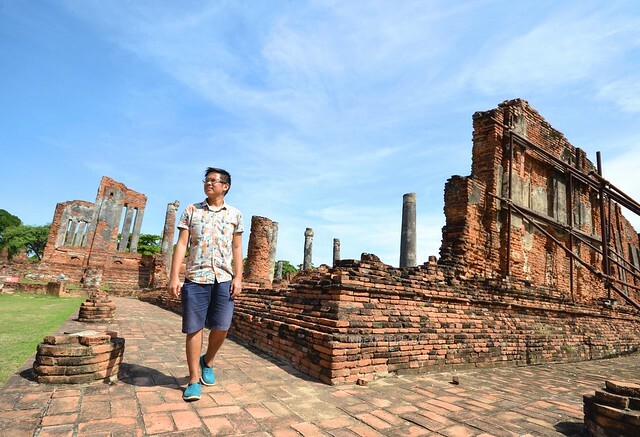 Doing a do-it-yourself tour is fine but it was already tiring to research and learn the routes and transportation to take so we availed an Ayutthaya tour that includes a buffet lunch and river cruise on Chao Praya River before going back to the city. 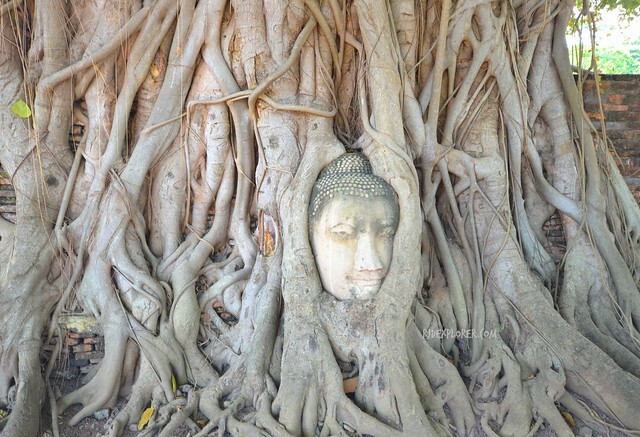 Buddha head trapped into the roots of a Banyan Tree in Wat Mahathat. Spend the few hours of the day to climb the few steps to Wat Saket. 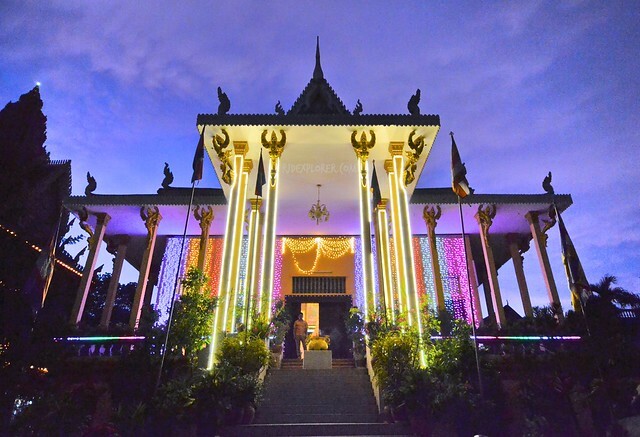 Wat Saket is also called the Golden Mount because of the gilded chedi atop of an artificial hill where the shrine is located. 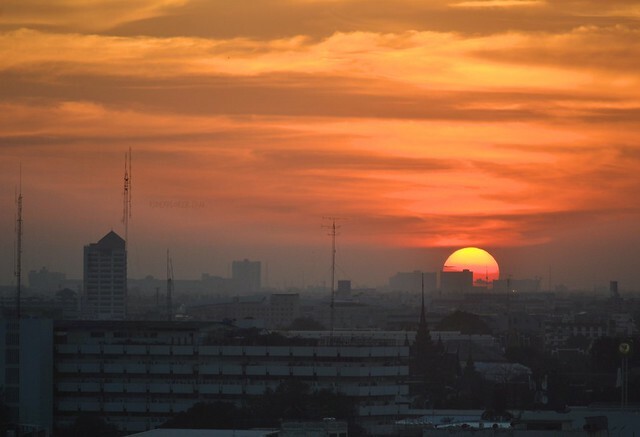 Enjoy the city view from the deck and wait for a stunning sunset. If you book an afternoon or evening flight back to Manila, you can still have the entire morning or day to visit temples in the center like Wat Phra Kew, Wat Pho, and Wat Arun. To end this Indochina itinerary, enjoy a plate of pad thai, curries, and sticky rice with mango on random street stalls in the city before heading to the airport for your flight back to Manila. 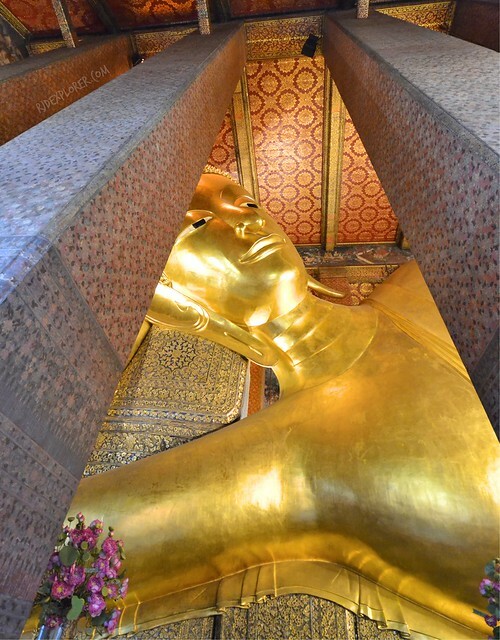 Reclining Buddha in Wat Pho. Oh you travel to Mekong Delta, so why don’t you go further to Chau Doc? You can catch a speedboat to Phnom Penh in 5 hours there and I strongly believe that getting the capital city of Cambodia by this way is much more interesting than by car. Additionally, there are so many exciting things that Chau Doc can offer like trekking in Ta Pa Mountain, boat tour around Tra Su and some temples. Anyways, thanks for your post! How do you get to Chau Doc from HCM? Won’t there be a problem with border crossing and immigration? Where will the check point be? Hi! Should I bring USD or would it be ok if I just withdraw money from the ATM? I’m going to Vietnam, Cambodia, Thailand and Malaysia in June for 12 days. I always bring USD just in case the cards won’t work. Don’t forget to call your banks to activate your international withdrawal. Hi! 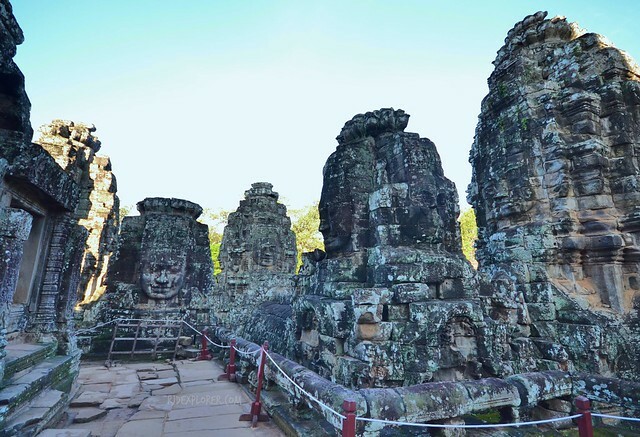 Can i have a copy of your Cambodia and Vietnam Itinerary? Please? Thanks in advance. Im planning to visit my mentioned place on my planned leave this July. Hope it will be all worth it coz im travelling solo. Hi, RJ. Did you encountered any problem on border crossing. A bit afraid about this. Had an issue at first from Vietnam to Cambodia when the bus conductor collected all passports of passengers on board. Had a trust issue but this is how the process works for them. For Cambodia to Thailand, it’s more on the chaos and lines that freaked me out, but in terms of clearing both immigrations, no issues at all. Hi where did you buy your ticket from ho chi minh to phnom penh?